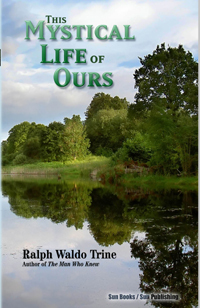 THIS MYSTICAL LIFE OF OURS A Book of Suggestive Thoughts for Each Week Through the Year by Ralph Waldo Trine. The Creative Power of Thought, The Laws of Attraction, Prosperity, and Habit- Forming, Faith and Prayer - Their Nature, Self-Mastery, Thoughts are Forces, How We Attract Success or Failure, The Secret and Power of Love, Will - The Human and The Divine, The Secret of the Highest Power, Wisdom or Interior Illumination, How Mind Builds Body, Intuition: The Voice of the Soul, To Be at Peace, Etc! 190 pgs. 5x8. paperback. ISBN: 0-89540-279-3. $17.00.